Moshe Cotel is a composer who loves to listen to the sounds of the city. He listened outside himself and he listened inside himself, just as his teacher had taught him when he was a boy. When he was done listening, he would turn all those wonderful sounds into beautiful music. One day, after he finished work, he headed outside to seek more inspiration. He hears a sound quite unlike any he has heard before. “It was a small sound. It was a sad sound”. 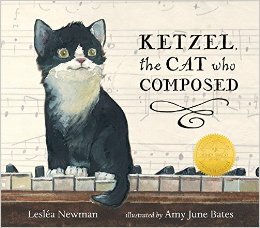 It was little “Ketzel,” a Yiddish word meaning little kitten. Moshe scoops up an innocent looking black and white kitten with the biggest green eyes. He tells him he will be taken home where they will make beautiful music together. 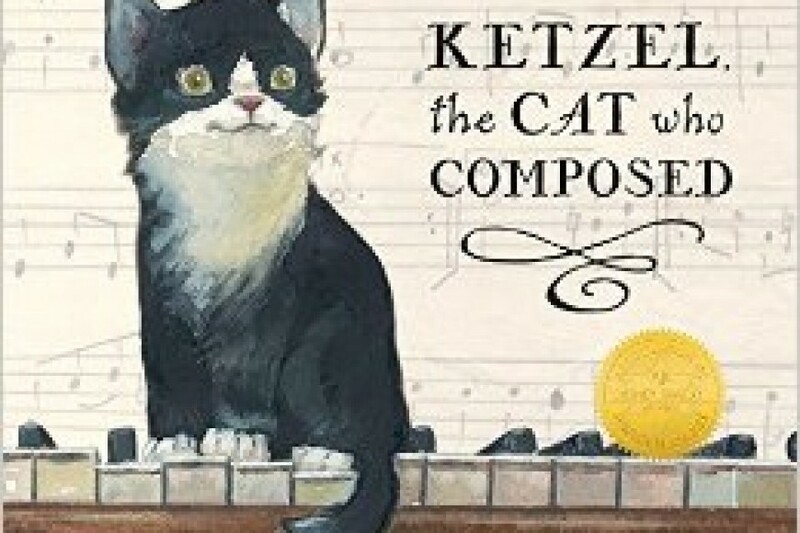 Moshe sets a place on top of the piano for Ketzel, who at first is frightened by the sounds emanating from the upright. When Moshe receives an invitation to write a one minute piece to compete in the Paris New Music Review, he is at a loss for inspiration. His pieces are too lengthy and he becomes more and more frustrated. His little feline friend senses this and one day sets his paws on Moshe’s piano. Moshe is in awe and immediately writes down the notes his kitty plays and enters the piece, “Piece for Piano: Four Paws” into the contest. Though not a winner, Ketzel earns a certificate of special mention and attends a ceremony with Moshe. Ketzel is later sent a check which he endorses (with paw print) and is set for cat food for a while. Much like the notes suspended on the stave, the book is illustrated with colors suspended in water. The resulting pictures in gouache, watercolor and pencil emulate the life of a composer and his creative processes; a discombobulated frenzy of scratched inspirations and tender layered compositions. The fact that the story is based on true events makes it even more special. The fact that you can look up the song the cat composed on YouTube is something you will most certainly want to do!